For those of you who’ve stumbled across this blog post and have no idea what I’m talking about, let me first introduce you to YA Shot and what’s going on with this awesome Blog Tour. YA Shot is an author-run, author-led YA and Middle Grade festival that encourages a love of reading, writing and creativity in schools and libraries. It’s a one-day annual festival based in London that is set to take place on 22 October 2016. You can find out all about it by clicking here. In the lead up to YA Shot, the team has organised an amazing blog tour, and today I’m honoured to be joined by author Sarah Alexander to talk all about books, writing, publishing, volunteering and even blogging, as she surprised me with a few questions of her own. So, enough of my waffling on, let’s get to the good bit. 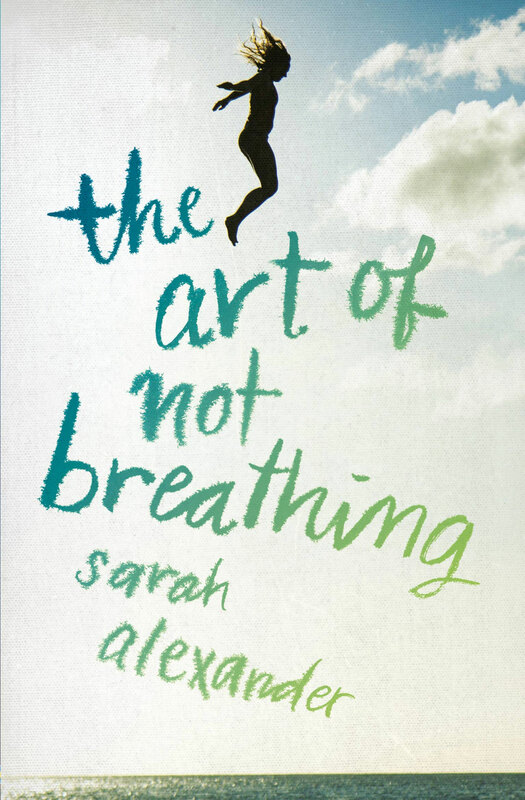 Prepare to be inspired by the brilliant Sarah Alexander, author of The Art of Not Breathing. Ashleigh: When did you start writing? Sarah: As soon as I was old enough to realise that I could ‘borrow’ exercise books from the school stationery cupboard – a ready-made book; all I had to do was fill the pages with words. I’d design the cover, add a contents page of chapters, write a blurb on the back cover and then scribble away! I was ten when my parents bought our first family computer so the next few years were spent filling up floppy discs with words instead. Thanks to Paint, I still got to design my own (terrible) covers. A: Was The Art of Not Breathing the first novel you ever finished writing? And how long did it take to write? S: Yes, it was! I’d had a bit of break from writing. Computers no longer used floppy discs so my half-finished novels (about ten in total) sat in a drawer collecting dust and I had no way of accessing them. Eventually, I started writing again – I tried three different stories before I had the idea for The Art of Not Breathing and once I’d written the first few thousand words I just knew I was going to finish this one. It took two years to write, though I spent most of the first year rewriting the first few chapters over and over again. A: Were you already an editor before it got to the editing stage of your novel? How did you find the process as a whole? S: Yes, I’ve worked in educational publishing for years so I was already very familiar with the different stages of editing (many) and the timelines in publishing (long to very long). But most importantly, I had an insight into the mind of an editor and the kind of things they can help with. When you’re so close to something you can’t see the wood for the trees so another pair of eyes is invaluable. My day job also helped me to think about my book from a reader’s perspective – it’s all very well using interesting language and abstract metaphors but will your reader actually understand what you’re going on about? A: Did much change from your original submission to the final book? S: Sometimes I’m not sure if I scene I wrote made it into the final version or when I made a certain change. I edited quite a lot as I was drafting so the overall storyline stayed pretty much the same between submission and publication, but my amazing editors helped me strengthen the characters, tighten up the pacing and bring out the subplots. A: If you could give 3 top tips to aspiring authors, what would they be? S: 1. Find people who want to talk about books and writing – it’s incredibly motivating when you meet others who share your passion. 2. Write as much as you can but don’t be hard on yourself if you go through periods of not having the time or inclination – you’ll find a way through it. 3. Be ruthless about your time. Even if it’s only twenty minutes, make sure that time is yours and use it to get the words down. A: YA Shot is all about inspiring young people to read and write. Do you do school visits or work with young readers in another way? S: I haven’t been into any schools yet, but it’s something I’d like to do in the future. I’ve just completed my volunteer training for Hackney Pirates – a charity who works to develop the literacy, confidence and perseverance of young people in Hackney, so that they achieve both in school and in the world beyond. The after-school sessions give the young pirates one-to-one reading support and the opportunity to work on creative publishing projects to practice their writing skills. And the best thing of all? It all takes place on the Ship of Adventures. Ahoy! A: You love travelling – what’s the most inspiring place you’ve been? S: Ah, soooo many places! I feel most inspired when I travel to rugged and isolated places. My love of the outdoors and nature feeds into my writing – whether it’s swimming with sharks or being at the top of a mountain above the clouds. But I also love meeting people from all over the world and discovering how similar we are despite living very different lives. My top three inspirational places, in no particular order, are: Scotland, Jordan and India. A: What is the best YA book you’ve read recently? S: This is a really difficult question. How to choose? OK, I’ll go with the most recent one – Seed by Lisa Heathfield. Dark, gripping and heart-thudding. Not sure I’ll ever be able to stop thinking about these characters. Inspiring, right? Sarah also wanted to ask me a few questions in return so read on for my advice about writing and blogging. Sarah: What’s your favourite YA book from 2016 so far? Ashleigh: I think my favourite has got to be The Loneliness of Distant Beings because it’s a mixture of everything I love in a book. I’m a bit obsessed with space so it is right up my street. S: I hear you’re an aspiring author. What are you working on at the moment? A: I am indeed, and I hope that I can one day have a published novel in my hands! But I’ve been working on my YA book for about two years now and am not close to finishing yet. It is very tricky to work full time with a long commute, keep up my blog and write a book too, I am in awe of people like yourself who manage it. S: I love your blog. So many excellent reviews! How do you think your work as a journalist helps you with blogging and writing? A: Thank you! Being a journalist means I know a lot about SEO which is a hugely important part of getting your blog in front of readers. But really, it’s probably more of a hinderance than anything because I spend all day writing and sometimes coming home and writing even more just isn’t appealing at all. Most of the time I completely love it though, I clearly can’t get enough. S: What are your top three tips for aspiring bloggers? A: My first tip would be to have patience. You’re not going to get a huge following over night, and most of the huge, really successful bloggers have been working on building theirs for five or more years. My second would be to be passionate – if you’re not passionate about blogging I’d say it’s worth considering whether it’s really for you. Blogging is about sharing your love for something with like-minded people, but if you’re in it for something else like fame or freebies you’ll probably find yourself disappointed. And my third tip would be not to beat yourself up about it. Having a schedule is amazing in an ideal world, but if you can’t stick to it and you find yourself falling behind a little it’s okay. As soon as blogging becomes stressful it’s time to take a step back and rethink it.